Dry noodles on the street, called Baa Mee Hang. A small yellow noodle with chopped kale, sliced pork and bean sprouts with soup broth of the side.This version has some boiled won ton and crispy pork bits as well. You add the topping you want- dried chili, fish sauce and Thai’s love to add sugar. Yep, sugar. I eat this for lunch two times a week- great street vendor on Soi Lang Suan, just past the seven eleven store on the left, maybe a 2 minute walk from the Chid Lom Skytrain station. The cost is 40baht. Dry Noodles with won ton, kale and dried pork. Yum. 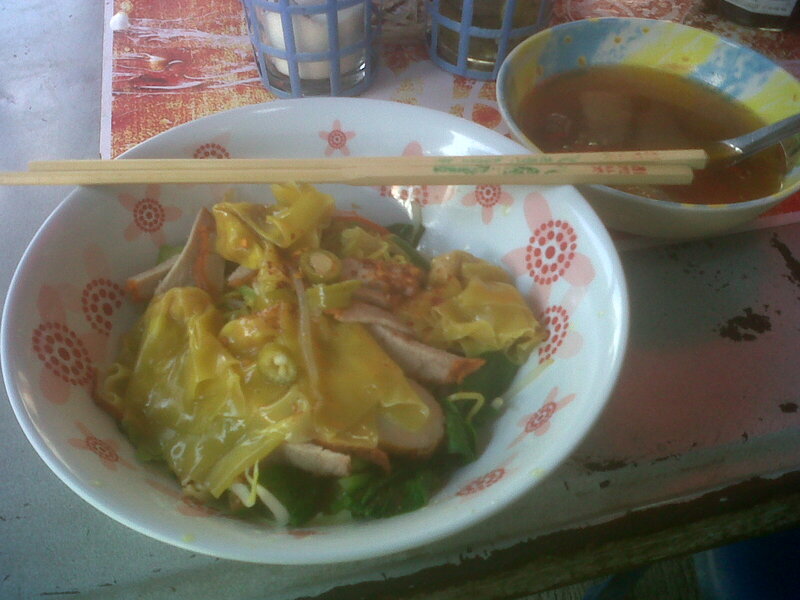 This entry was posted in Bangkok, Food & Restaurants, Thailand and tagged Bangkok, noodles, soup, street food, thai food, travel to Bangkok now. Bookmark the permalink. With such a wide choice of dishes it is strange that we all seem to gravitate towards a few favorites but we are all guilty of that! !